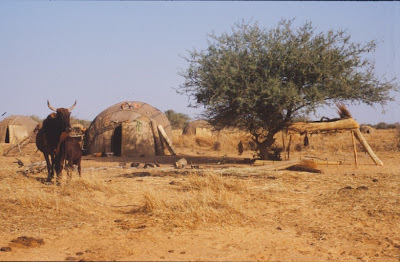 Fereriwo, a temporary settlement of Fulani semi nomadic herders, in the Sahel of Burkina Faso (West Africa). I had the chance to do ethnobotanical field research there, spending every year 4 to 6 weeks at this place, during five years. It was a fantastic experience. The women of Fereriwo. Fulani woman are said to be the most beautiful in this region. Very different especially compared to your recent photo of cherry blossoms. Julia what a change from Japan! You couldn't dream of anything more different! And how lucky you were to go there for work, I'm sure the relation to the people must be very different from being a tourist. Great photos for this theme day! Beautiful colors on that picture! Lovely photos! So different from Japan I had to come in and see. I must say...This is the BEST post for theme day. I love the portrait of the group. Simply beautiful. Thank you Julia. Nice group photo. Thanks for sharing this. A splendid photograph of a worthy choice. My Theme Day portrait is of the "Peashooter" and the National Museum of the United States Air Force. Hope you like flying. Very nice! What a great experience it must have been! Thanks for sharing. Wow, that must have been an amazing experience. Those photos are wonderfully refreshing. Thank you for sharing those. Yes...I agree...great exotic beauty! Happy Theme Day from Maui, Hawaii!